Achieving the dream co-op takes hard work, careful planning and well-honed interview skills. Or, in Cassandra Vidal’s case, one could break the ice by nearly spilling coffee on the recruiter, apologize profusely and still walk away with a job offer. Despite the close call with spilled coffee, Vidal’s interview with a recruiter from Cisco went well and she was offered the co-op – in North Carolina. Vidal hadn’t planned on relocating, and while she was excited, there were some nerves associated with moving several states away. She had never lived outside Philadelphia. 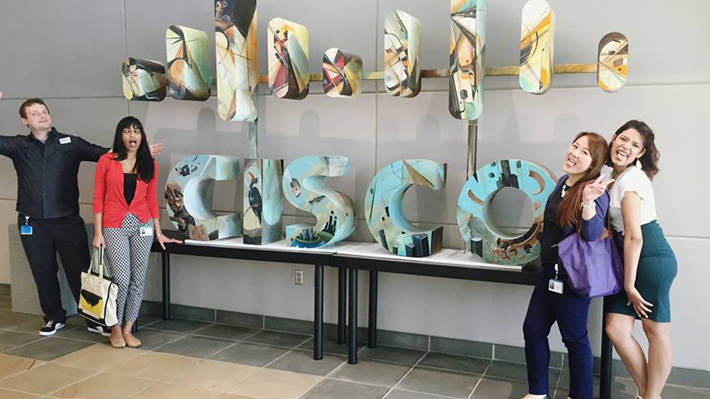 To cap her experience, Vidal was recruited onto a project to rebrand Cisco’s internship and co-op program with the goal of increasing their retention and reach beyond local colleges and universities. She helped design a new social media presence (@cmc_eic) and marketing collateral to be distributed at recruiting events. The experience was so positive that Vidal switched her major from general business to marketing once she returned to campus. And in addition to the major change, Vidal’s time at Cisco served to enhance and focus her studies. “I absorbed everything I learned in class on the off chance I went back to Cisco and now I could use all this new information,” says Vidal. She gives her time at Cisco glowing reviews and the feeling was clearly mutual. Her former manager helped set up a second potential dream co-op at the company’s headquarters in Australia. That plan had to be put on hold when Vidal agreed to help provide childcare for her sister’s new baby, but Cisco was quick to offer a work-from-home alternative. Like many soon-to-be graduates, Vidal is consumed with wrapping up her final courses while apartment hunting on the side. She won’t have much transition time between Commencement and career, but Vidal wouldn’t have it any other way.